One of the great advantages of developing a technology that is designed to solve various problems is that in the end, this technology finds its use to someone who wasn’t originally intended for. This is the case with bone conduction headphones. The technology itself was originally intended for people who had hearing problems and for those who had slightly damaged hearing. Thanks to the creativity and knowledge of engineers, today, this technology is available to everyone, and its benefits are truly incredible. The operating principle of these handsets is very special. The reason lies in the fact that this technology was originally intended for a very specific target group. This group of people had a hearing problem. The essence was to make a technology that would allow them to hear a sound even though their hearing was damaged, that is, despite the fact that there was a problem with eardrums they could hear. Thanks to the innovation of the people who developed this technology, the solution was found by transmitting the sound through the bones in your skull. It sounds weird, but it’s not. Bone conduction headphones send vibrations that go through your face to the bones of your skull and reach your inner ear. So your eardrums are free and you can hear sounds from your immediate surroundings. No, this is not the end of this story. The story is much more complex and is actually mind-blowing. Most people never heard anything like this, most people don’t even know what it feels like or why they would buy such headphones. After our story, you will wonder how you’ve lived without these headphones so far. 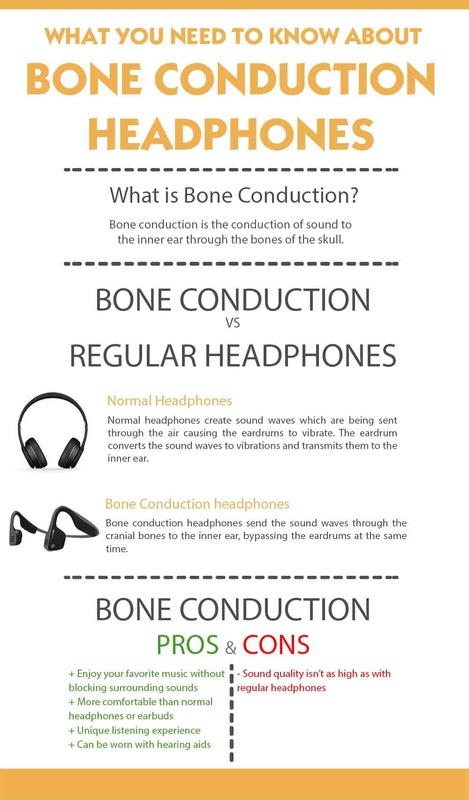 How do bone conduction headphones work? Since it’s difficult to understand how the sound is transmitted using bone conduction headphones, and that it’s not over eardrums, we will try to be as detailed as possible in the description, but at the same time, we will use a combination of simple language and scientific facts. A large number of people when they first test these bone conduction headphones are both thrilled and terrified. The reason lies in the fact that you perfectly hear the sound of music you listen to and at the same time you can hear everything else that is happening around you. The sound of speech, car, sirens, child’s cry, etc. It’s like you have some supernatural powers, you have your music “in the head”, figuratively speaking and everything else works normally. All the environmental sounds are still there for you to hear them. You can pay attention to them or just ignore the sounds from the nearest surrounding and stick to the playing music. There are two ways the sound is transmitted, one is directly over eardrums, it’s a feature of classical headphones that you can buy in different variants and with different accessories. And there is another way the sound is transmitted, that is, through vibrations that don’t go through eardrums, but over bones, more precisely, over cheekbones, directly transmitting sound to the inner ear. To understand this better, we will explain the structure of the ear itself in short terms. The ear consists of three parts: the outer ear, the middle ear (tympanum) and the inner ear (labyrinth). The sound is normally transmitted with the help of sound waves, therefore sound is one type of wave having its own frequency. These waves travel at a speed of 740 miles per hour (343 meters per second). This frequency is expressed in a unit of measure called hertz (Hz). However, the sound waves have also an intensity expressed in a unit of measure called pascals. So, we have waves of sound pressure (Hz) and sound intensity (micropascals). We hear normal sounds by transmitting it from the outside of the ear to the eardrums and farther the sound is transmitted to the inner ear. The ear canal protects the eardrums and directs the sound to the eardrums. The inner ear is if we look at the structure, a natural piece of art. Inner ear converts the sound into an electrical impulse that travels through the ear nerve to the brain. The inner ear is in charge of balance, without it we can’t move and do anything. Thanks to the technology used in these bone conduction headphones, which was intended for people who had damaged eardrums and therefore they couldn’t hear well or at all, the sound is sent directly to the inner ear, literally by passing the eardrums. When you have normal hearing, this technology allows you to listen to music and hear everything around. At the same time, you can play your own music regardless of the world around you and the events around you. Very often this technology is used by the scuba divers because of the specific conditions in which the divers are located. 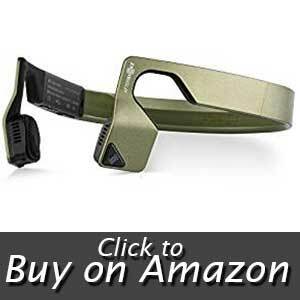 This technology and these bone conduction headphones have a particularly important place in the field of military communication. Due to the way the sound is transmitted directly to the inner ear on the battlefield, you are able to fully monitor all happenings while at the same time you have 100% functional communication with people online. In these circumstances, this is really a matter of life and death. In other words, if the army uses this technology, then it has to be the best. Why did we choose this product? They are very well designed. They are produced and can be bought in several different colors. They are one of the best-selling and one of the most praised headphones in this category. You can buy them in 5 different colors: slate grey, pink, ivy green, red and ocean blue. They are very resistant. The headband is made of titanium. It’s coated with the quality color material. Very lightweight and flexible. You can wear them for hours without having that awkward feeling that something bothers you. In many cases, you won`t even notice that you have them on you. Very rich bass, the technology is Bluetooth 4.1 which guarantees a very good connection with the devices. It has a standard IP55 which means they are resistant to moisture, dust and sweat. The device allows 6 hours of music with one charge. You also have a two-year warranty. These headphones do not go directly to your ears, but somehow in front of them. It’s a little strange feeling at the beginning, but it’s actually very good sound quality. With them you get earplugs and when you put them the sound is much better, especially bass. Then you can feel better bass because you are more isolated from external sounds. You can pair them with multiple devices and use them alternately. The sound is clear and the headphones are very comfortable to carry. The controls are quite simple, you have a master button that offers more options and two volume buttons. Simple and easy to use. The sound is very good, but because you are not completely isolated, you can hear everything around you, these headphones will not kick you off if you are looking for superb sound. However, if you put earplugs then the sound really gets great. They are very good for jogging, for strenuous training, for high heat during the summer period. You can do any job while keeping up with everything that’s around you because you hear everything. Some people have complained that you can’t adjust them depending on the size of the face, i.e. heads. And because of its basic characteristics, people sitting near can hear what music you are listening to or talking on the phone. 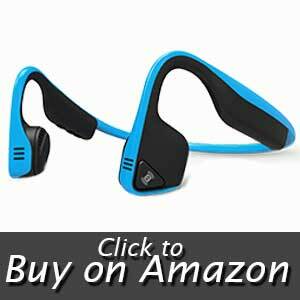 Based on everything we’ve seen and tested, these are very good bone conduction headphones. When evaluating such headphones you have to consider that this technology is something special and has its clear purpose. So, you can’t expect a superb sound that will delight you, from which your skin will shrink from pleasure. AfterShokz Trekz Titanium (AS600OB) headphones are designed for people who want to enjoy quality sound but don’t isolate themselves completely from the environment. They are not intended for passionate enthusiasts of superior sound. 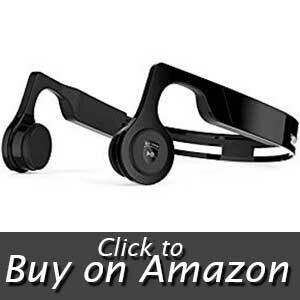 As long as you have this in mind, you will be very satisfied with these bone conduction headphones. They are shiny, they are flexible, the buttons have a good response, they stand well, they do not slip. They are small. You can adjust them to the size of the head, use the accessories you get along with them. 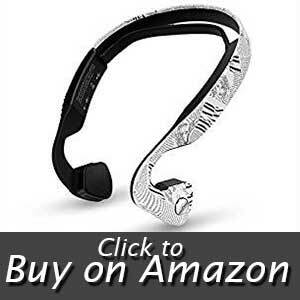 All in all, a very nice bone conduction headphone product. You can buy this model in two colors: blue and black. Maybe this option of only two colors doesn’t suit you best but keep in mind the purpose and the fact that black and white go along with everything. The sound is very good, HD sound. The bass is quite strong for this type of headphones. It has a built-in microphone so you can answer your phone calls too. It uses the latest Bluetooth 4.2 technology, so the connection is fast and easy. It can be connected to two devices simultaneously. They are great for activities where there is plenty of dust, moisture, sweat since they are resistant to all this. This means that they are ideal for running or perhaps for sauna users to relax additionally with their own choice of music, or to just do the housework and simply make cleaning more enjoyable. They are really lightweight. Most people like it. You can bend them because they are quite flexible. They will not break if you even bend them in some directions, but don’t overdo it. They are simple to use, there is nothing superfluous. When charging them you see the light indicators and the red LED lights turn on, when the battery is charged, the blue LED lights turn on. Very sleek and stylish look. All the objections that people have had are very mild and almost irrelevant. They have 90 days warranty, so it’s best to try them during those 90 days. If a problem occurs, simply, return and get new ones. Again, we are in the field of new technologies, some people like it and others don’t. The fact that these headphones don’t enter directly into the ear means that the sound can’t be like the sound with classic headphones no matter how good it is. Simply, this type of headset isn’t for everyone. It’s for people who have a need for music but don’t deal with music in a professional way. As long as you have this in mind, you will be satisfied. Some people have complained that they have an uncomfortable feeling after a long period of use at the place where these bone conduction headphones touch the bones in the face. This could be more a matter of habit than a real problem because the headphones don`t put pressure, so they can’t reflect pain. We liked them. We didn’t notice anything drastic that we would point out as a drawback. Certainly, JUHALL Bluetooth V4.2 , draw our attention and deserves a recommendation. These bone conduction headphones have a fancy look. The sound is very good and we think they are great for everyone regardless of age and no matter what activities you are having: walking, cycling, running, driving cars, children playing, dog walking, whether you are 18 or 80 years old. You can buy these bone conduction headphones in two colors: classic black and fancy newspaper color. They are easy to use, the battery lasts for a long time, on average longer than in some other models. They are very well made, the sound is great, they are also suitable for people who have a really bad hearing because the speakers are 1W, which is quite enough for this type of headphones. What’s particularly striking with this bone conduction headphones model is a large number of positive reviews of people with hearing impairments. These people say that this model proved to be excellent, regardless of having a hearing problem, thanks to these handsets they can enjoy the music they love. Some people have complained about the damage that occurred during transportation, but thanks to a good customer service and 1-year free warranty from the manufacturer, this was easily solved. No other disadvantages regarding the device were noted. Because of the volume of the speaker and the technology itself, when it is amplified, it is heard loudly around you and the space where you are located. The others can hear if they are around so it could be ascribed as a lack of privacy. We can only praise them and we warmly recommend the Bone conduction headphones by Oannao. This model of bone conduction headphones caught our attention firstly because of one feature – it has deep bass. If you want to use it for a particular kind of music, this is an advantage. It’s also simply designed but simplicity mostly means elegance. The headphones look simple but nice. The battery is quite good, it allows 4-5 hours of continuous listening to music. It recharges within 2 hours. Portable and lightweight. When you take them in your hand, they look pretty good and of high quality. The people who tried them were delighted. They liked everything about them, design, material selection, final processing, sound quality. Some people used to wear over the head headphones but they got itchy ears after using them for a while. They also say that these Bone Conduction Headphones felt weird at first but after wearing them for a while it was miraculous. Especially convenient for running or riding a bike cause the stay on cheekbones and don`t slip. There were cases noticed where people suffered severed earaches or swelling ears after using in-ear buds so they decided to use these instead and felt reborn. Some have complained that they have to delete previous devices when they are re-pairing; in other words, they have a problem with automatic pairing when using them on multiple devices. But only some noticed this. If you don’t mind this bulky look, then this model is great for you. Bone Conduction Headphones proved to be very durable for people who are sweating, training, and spending a lot of time outside. The sound is very good for this type of headphones. It’s good for both the young and the old. When it comes to sounds, this bone conductor headphones are one of the best we’ve tried. They are very comfortable to carry, lightweight. Attractive design adjustable if you have to tighten them a bit, but they do not extend. You can buy them in 4 colors: neon green, red, black and green metallic. This model has dual suspension transducers that can be heard perfectly. The sound is excellent with a dynamic volume range and the bass is also very pronounced. It meets the IP55 standard, which means it’s resistant to rain and sweat. It’s very well heard even in an environment where there is a lot of noise. Their working range is about 10 m (33 feet), which is common for this type of headphones. The battery lasts up to 6 hours of constant listening to music, it’s charging time is 2 hours. You can even use them while being charged which is not possible with many models. All in all an interesting and attractive product. They are definitely designed for people who are on the move, all the time. Bass isn’t particularly strong, as well as lows, but the sound is great. Depends on what type of music you are listening to. It’s essentially a different feeling than with classic headphones because this technology uses vibrations and they aren’t the same as bass with regular headphones. Still, they are very good. As for the sound leaking, this is minimal. In total silence, people can hear what you are listening to, but generally this leaking isn’t particularly pronounced. So, you will not bother anyone with that. They are very comfortable, you don’t have to worry about sore ears from clamping force because they are very gentle. They lie nicely, they don’t slip. Some suggested that it would have been better to have a silicone band around the back in terms of adjustment and comfort but they are quite ok in this way too. The others have complained about the quality of sound when talking to someone over the phone. The main advantage of this model of bone conduction headphones is security while doing everyday activities. You can listen to music and keep track of everything and hear everything around you. They will not slip from your head, they will not break. This model is really good at it, the quality is high and it`s made of flexible material. The sound is good, there is a minimum of sound leaking. The headphones can be adjusted depending on the size of your head, there aren’t too many options for it, but you can still adjust them. Aftershokz Bluez 2S (AS500SM) definitely have a recommendation from our side. These bones conducting headphones are more robust but are therefore very suitable for all sports activities and for people who lead a dynamic life, who are constantly on the move or training. We would also recommend them to people who are professionally engaged in sports because they are very durable and convenient for all kind of sports. They are beautifully designed and very easy to use. You can buy them in black color. They are very flexible, but at the same time very durable. The quality of materials from which they are made is extremely good. You can bend and twist them and they will continue to work properly. They have simple commands – On/Off button and for volume up and down. They are made from very soft materials that are lying perfectly on your skin. 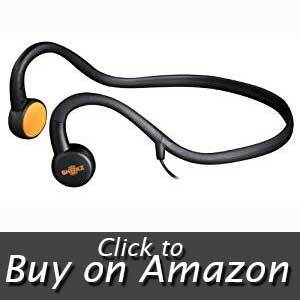 They are very lightweight, sweat proof, with Bluetooth technology 4.1, CVC noise reduction. They are suitable for entertaining, working, cycling, running or driving. People who have tried these bone-conducting headphones are very satisfied. The sound is very clean. Noise isolating works great. They are very comfortable. Lightweight. They are very durable. These headphones come in 3 sizes. That way you can choose the size that suits you best. They are not noise cancelling, but noise isolating headphones, this is the main remark to pay attention to. Although it says noise cancelling, they are not actually. The sound is really great for this type of headphone. This is an example of very good bone-conducting headphones. Everything works fine for them, they aren’t perfect, but very good. The sound is very nice. Ergonomics makes them pleasant to wear. The light weight makes them comfortable even when you wear them for hours. There is no feeling of discomfort or tightness when you wear them because of the materials, different options of size and shape.The battery holds up to 5 hours, they are resistant to sweat. All in all, very good bone-conducting headphones for a decent price. These bone-conducting headphones are slightly different than most models because they use a cable. The cable is long enough (four feet) to connect to your phone even if it`s on your arm, waist, or waist belt. On the headphones, which are very lightweight, you don’t have any buttons and controls. They are located on a special add-on that is positioned on the cable itself. They are very small in size. They are resistant to sweat, moisture and water. Commands are easy to use. They use a 3.5 mm connector. The battery holds up to 12 hours which is really long and it charges very fast if you need to use them again. They have a noise-cancelling microphone so you can talk without any problems by just using these headphones. The audio quality is more than great. They really justify expectations. Good and clean sound and many say that is far superior to what they `ve expected. High-end microphone. They are small and lightweight. They are suitable for all activities, although they aren’t resistant to extreme conditions. It happened that there was damage to the 3.5 mm jack or on the handset itself. The option of phone calls works very well too. Many people said that these headphones are most suitable for cycling or running, you can hear everything around you especially traffic while you enjoy listening to whatever suits you. It`s very easy to reach buttons if you want to turn the volume up or down or to pick up a call. On the other hand, some users said that they are more intended for those people who enjoy music or audiobooks in a more peaceful environment than those who deal with sports. Basically, everything depends on your expectations. These are quite good bone-conducting headphones that use a cable. The sound is good, clean, the microphone works fine. They are lightweight, the battery, holds up to 12 hours, very long indeed. The materials are good, soft, not too durable, especially for those who are more seriously engaged in some sports activity, more for recreation than for professionals. When we take all the features into account we give our recommendation for these Aftershokz AS450 Sportz M3 bone-conducting headphones. This is a relatively new technology. 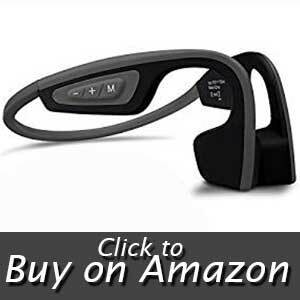 Many people have heard of these bone conduction headphones, but haven’t had any experience with them. In order to help you choose the right model for you, we will point out a few things which drew our attention to and help you out to choose the right model for you. First and foremost, the ultimate rule is that you do not expect a superb sound that will knock you off, where bass, lows, mids, highs will be clearly separated, where everything will look like you are at a concert, etc. These headphones aren’t made to give you superior sound which is possible with some models of over-head headphones. Bone conduction headphones are designed for people who are quite active, who work, exercise or do things that require some movement or action. At the same time, you have the ability to answer the phone calls or listen to music. All this and plus the ability to hear what’s going on around you. If you have a baby, you can hear if it cries, if you’re driving a bike, you hear cars, buses, motorcycle sound. In this case, it`s important to stay on alert to environmental sounds for your safety and yet enjoy listening to music all the time. This is the advantage and specificity of this particular technology. Are bone conduction headphones safe? The simplest answer is yes. These bone conduction headphones are very safe. Due to the specific technology that transmits vibration to the inner ear via cheekbones, there is absolutely no chance of damaging your ear. In addition, there is no possibility to irritate the ear shell, no eczema, fungus, inflammation, redness, none of it.They don’t even have a clamping force due to their ergonomic design, but the feeling is a little unusual until you get used to it. Still, they are headphones, which means use them normally. Excessive sound is harmful, regardless of advanced technology. Are bone conduction headphones better for your ears? The Bone Conduction technology is a different experience from classical headphones but many people loved it. 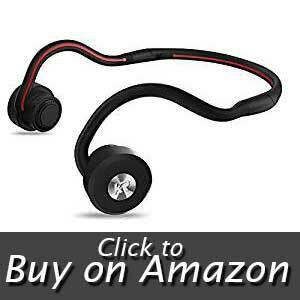 Bone conduction headphones are much better for your ears, much healthier. You can’t overdo them as with classic headphones where the sound can be extremely strong. With these bone conduction headphones, this isn’t possible because they can`t produce that extremely strong sound, and the sound vibration technology enables audio transmission directly to the inner ear. However, if you turn them up too loud, that’s not good for your hearing. What do bone conduction headphones sound like? The sound is good but not layered. This means that you can’t feel complex layers of lows, mids and highs with all types of music in the right way. Luckily, there are different models, with a stronger bass, with a weaker bass or other options. However, they aren’t made for the ultimate enjoyment of high-quality sound. As long as you don’t expect a miraculous sound you will be satisfied. But they are headphones and they satisfy their purpose. Can you use bone conduction headphones along with hearing aids? This depends on the type of hearing aids. If you use behind the ear hearing aid you may have a problem, but if you use the one that goes straight into your ear no problem. These bone conduction headphones are particularly good for people who have hearing issues because they offer the ability to enjoy music despite the fact that they have slightly or damaged hearing. Can you use bone conduction headphones with Smartphones? Bone conduction headphones are made to connect to all devices via Bluetooth technology. Among other things, with smartphones. Quick and easy. With some models after auto-connecting, you have to erase the device to re-connect but this doesn’t happen often and with all models. Can you use them while jogging or running? Many people wonder if they will off from your head while moving. They are made to stay still on your head while doing any sports activity or aggressive work. You are also provided with an extra strap to create a tighter fit if needed. You need no concern on this issue – they won`t move. Can they fit on a bigger head? A lot of people wonder if these headphones would fit their big head. Most likely they will, they just look small but they are made to fit all sizes. For those with small head there are extra straps to tighten them but yet you can lose them to their normal size and in most cases, they will fit. Those who have extremely big head might feel discomfort but they fit just fine for those who wear XL helmets or 7 ¾ hats. There are different models on the market to choose from. Most of them are water resistant, but there are also models that are waterproof. Of course, you don’t need to immerse them in the water to check this, but they are pretty durable. For us, the discovery of this technology is a real revelation. You are listening to music, enjoying your favorite sounds while driving a bike through the city crowd, and you hear everything around you. There is no risk of someone running over you by the car because you haven’t heard it’s coming. Choose another scenario. You run through the woods, listening to music, and then out of nowhere, the wild guys appear on four-wheelers that cut across the track you run. No problem, you heard them coming. If you don’t hear well for some reason, it can be really irritating. You can’t enjoy a lot of things and especially bothering is that you can’t enjoy your favorite music. Well, thanks to the bone conduction technology, and the best bone conduction headphones of your choice, you will be able to listen your favorite songs.